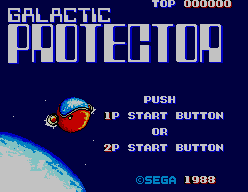 One of the few Japanese Mark III games that did not see a Western release, Galactic Protector is a charming Fantasy Zone spin-off (well, it features Opa-Opa and his brother Upa-Upa), but plays quite differently to the traditional FZ games. It requires the Paddle Controller to play, which explains why it was only available in Japan. 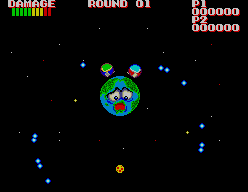 Using the Paddle Controller to rotate Opa (or Upa in 2-player mode) around one of 3 different planets (Earth, Jupiter & Saturn), your mission is to protect the planet from bombardment by various types of hostile space-rock (no, not the Godspeed You Black! Emperor variety ;) ) . There are several slightly different types of attacking debris to blast away, which approach in set attack patterns and gradually get closer until you either zap them or they succeed in crashing into the planet and depleting the damage bar. Game Over occurs when this bar reaches zero, or when Opa/Upa loses 3 lives by colliding with the attacking debris. There's also occasional power-ups, and collecting a couple of these will give you a spread-shot that makes things considerably easier. 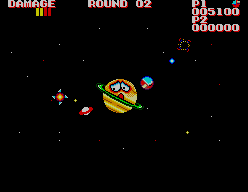 Despite most of the screen representing the black void of space, the graphics are nice and colourful. Simple but well done, they are composed entirely of circular shapes (which has the side-effect of making Opa-Opa look a bit chubby! ), and move at quite a pace. The planets have animated faces with a range of expressions, and react to the oncomers, looking worried or unhappy, and wince as they are hit. Pretty typical SMS fare here - the title theme and level tunes are all nice and cheerful, but there's not a great deal of variety, and can get a little repetitive. The Paddle Controller is crisp and responsive, and after a little practice you'll be pulling off pixel-perfect spins around the globe without a problem. Since you'll be firing pretty constantly anyway, a Rapid-Fire Adaptor would probably be a good addition (assuming it's compatible with the Paddle Controller?). It's an old-school score-attack game, really - there's no bosses, and the planets continue to loop after clearing all three. Oddly enough, in a 1-player game the hardest challenge comes in the first few rounds - with only three lives, it's easy to be caught out before having the time to collect two of the power-ups which give you a 3-way spread shot. This makes things much easier, allowing you to hit several rocks at once and with less precision. Once the spread-shot is in place, it's much easier to clear a round without taking any damage, a feat which results in a smiley planet and 'Perfect' sample. Other power-ups can also be found later, including wider spread-shots and a transparent shield which will take a hit for you. I'm not sure whether the levels loop continuously or if there is an ending - I've been to Round 19 so far, but am still being pulled back to try and better that. I am very fond of this game - it's the type of simple but fun game I'm drawn to, and is perfectly suited to a quick 10-minute fix every now and again. While I wouldn't suggest splashing out on a Mark III or Japanese SMS and a Paddle Controller purely to play this game, if you have the means or are planning to get them, I'd certainly recommend it. It shouldn't be too expensive either - I got my copy for a very reasonable $10 (CIB).